We left Sibiu on a cloudy Saturday morning at about 10 AM and in one hour we were in Geoagiu, a small town of 5000 people. The town has quite an old history. 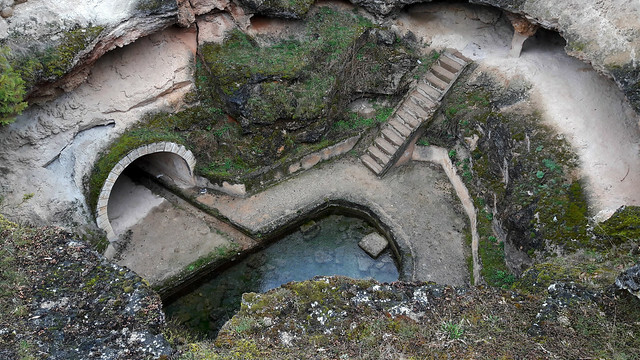 In the time of the Dacians, in the 1st century BC, the place was called Germisara and was renowned for its thermal waters. 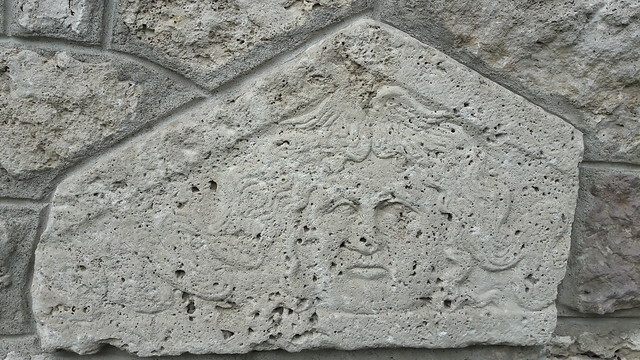 After the Roman conquest, the Romans built the fort of Germisara in the 2nd century, however, it kept the original Dacian name. One of the most important monuments from Geoagiu, and the main reason for stopping here, is a small circular church from the XI century, called Rotonda. This is one of a king because of its circular shape and it is the oldest church in Romania. In the same courtyard with the Rotonda, is the old Reformat Church from the XVI century. What is interesting about this church is that it has Roman Funeral stone on its walls and 2 Funeral lions at the entrance. Unfortunately the church is closed for visiting. Next stop was 6 Km from Geoagiu, at Geoagiu-Băi a well known balneoclimateric resort. 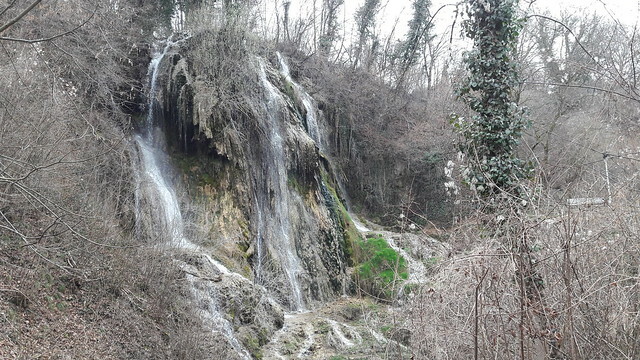 Just after you enter Geoagiu-Băi, there is a pathway to the Clocota Falls, a 20 m fall on the Clocota River. The waters of the river collect all the thermo-mineral springs in the area and, due to their temperature, they are a good environment for thermal water specific plants and animals. The rain started when we left from the waterfall, but we still had one more thing to see in Geoagiu-Băi before leaving to Deva. One of the most interesting places to visit in here is the Germisara thermal springs complex, so called “The Hill of The Romans”. 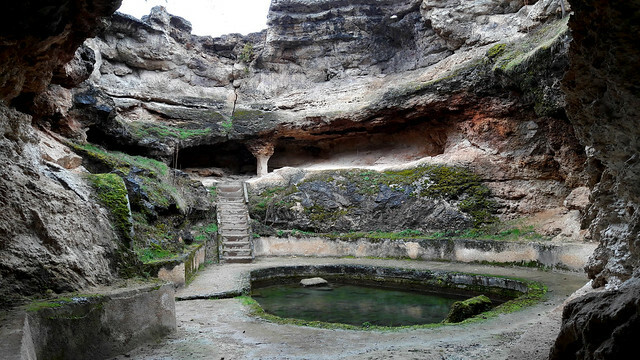 The Romans arranged here, underground and on the surface of the hill, small pools where the hot water was channeled. The big pool from the underground has water also today. From Geoagiu-Băi, we traveled 35 Km to Deva and we arrived there just when the rain stopped, at around 3 PM. The first thing we visited was the Magna Curia (Bethlen Castle built in 1621) which holds the Museum of Dacian and Roman Civilization. Among the permanent exhibitions, we were lucky to also see two temporary exhibitions. An interactive one presented by the Babeș-Bolyai University from Cluj and especially the exhibition of The Matrix of Sarmizegetusa Regia. This is an ancient bronze matrix, over 2000 years of age. The matrix was discovered in 2013, after a strong storm pulled a tree from the ground. Under the uprooted tree the bronze matrix was laying. After visiting the museum we relaxed and played with our baby in the Cetate Park nearby. We checked in at our guesthouse and prepared for dinner. The offer is not so big in Deva and the rain was pouring, so in the end we went to an Italian restaurant, which was quite OK, but the price was more than we expected for Deva (similar to Sibiu). After a very good sleep, we were disappointed to see that it was still raining. 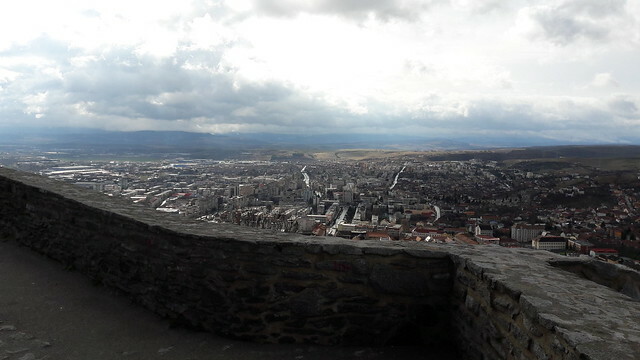 While we had breakfast at the guesthouse, the rain stopped and the sun was out again, so it was time for us to leave the house and go up to the Deva Fortress. 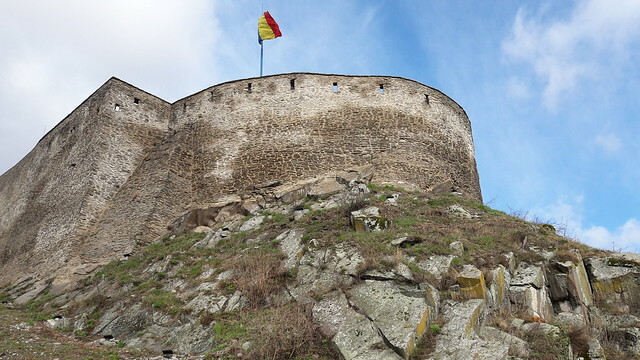 The Deva Fortress was built at the middle on the 13th century, on the top of a hill, a volcanic cone at the 378 m. In the medieval times, it used to be one of the most important Transylvanian fortresses and it guarded for centuries the entrance to Transylvania on Mureș Valley. The sun was shining between the white clouds and the view from the fortresses wall was absolutely stunning. The valley and the city building were shining in the light. We walked for about 90 minutes thorough the stone walls, admiring the view and breathing history from these walls. At the entrance of Simeria we saw a touristic sight pointing to the Castelul Lupilor (Wolves Castle). We were surprised because we didn’t know about this castle, so we decided to search for it. After 10 Km we found it in the village Chimindia, but is was no castle in ruins. 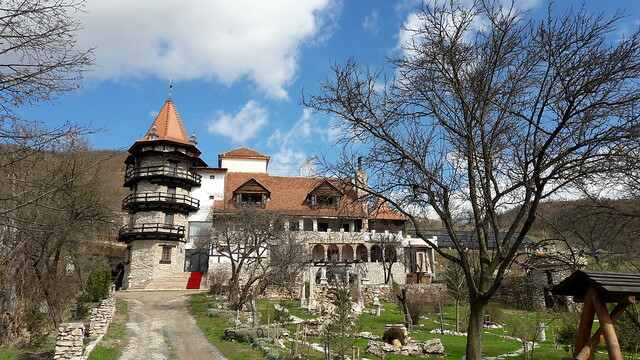 Actually it’s a hotel built on the ruins of a 18th century castle (I’m not sure if a castle was there in the first place or they only try to sell this story). We had a walk around to see what is had to offer and, as it was lunch time already, we decided to eat there. The food was OK, but the price was much more than we expected. It’s more like a tourists trap. Since the weather was nice and sunny and we still had a lot of time to return to Sibiu, we changed our plan once more and drove to Sarmizegetusa Regia. From the Castelul Lupilor it was a 60 Km and 1 hour driving. Well, the surprises kept on coming. As we were approaching the 1000 m altitude, we entered the winter season. The temperature was around 5-6°C and it was snowing. We entered the site (10 lei fee) and had a quick tour through the ruins, puddles, mud and snow. Since it was quite cold and we had our baby with us and no winter jackets, we promised that we would return sometime in the summer for a full weekend in these beautiful mountains and mysterious ruins. Just by dinner time we arrived safely to Sibiu (were it was raining like crazy) and we relaxed for the rest of the evening. It was a really nice and comfortable first road trip with our little one, although there were some bad moments in the first day at nap time. We managed to get over them and we had a lot of fun. We started with no particular plan and in the end we managed to do more than we could imagine.